HSIA through the hotel, a hard connection in each guest room is available at no charge. Local calls are complimentary. 24hr Concierge, In Room Dining, Valet and Housekeeping. Complimentary Transportation within a 3 miles radius, on a first come basis. Spacious guest rooms and suites, each with a Tuscan feel and equipped with flat screen HDTV. Complimentary in room coffee. All windows are operable. Breathtaking views of the outdoor pool or lush green space with mature trees provide each room with a special view. Most rooms have fully equipped kitchens with china, glassware, cooking ware as well as balconies. Dining at Houstons luxurious Hotel Granduca is always special. Ristorante Cavour is one of the few Authentic Northern Italian cuisine. Celebrate afternoon tea in Sala del Borgo as you overlook the magnificent gardens. Light menu and drinks available at Bar Malatesta and on the Veranda. The first floor is comprised of the Grand Salon entry, 24hr business center, billiard room, lounge, library, dining areas, health club and a beautiful heated pool and spa. ADA additional hotel description, 6 accessible parking spaces are located approximately 60 feet away from Front Entrance, which is attended by a doorman 24 hours a day, a convenient door knocker is placed at the appropriate height and center of each door. Front Desk is accessible to Wheelchair Guests as well as elevators and Guests rooms. Elevators are equipped with Braille indicators and illuminated numbers for the Hearing Impaired. Business Center, Fitness Facility, restaurant, lounge and meeting rooms are located on the first floor and accessible to wheelchair Guests as well as Swimming Pool and Hot Tub (a mobile lift is located in the pool area). Portable sight and hearing impaired devices available upon request. Located in the Galleria/Uptown Park district. Just steps away across the street find the renowned Uptown Park Shopping Center with many wonderful boutiques, restaurants and spas. 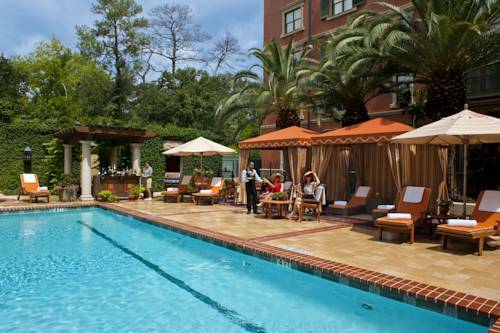 Houston's finest entertainment, theater, the famous Galleria, and Texas Medical Center are also in close proximity. Meet family, friends or colleagues at the end of the day for drinks in the Grand Dukes Main room. Bar Malatesta faces the Veranda and pool. Light menu available. Soft live music Wednesday through Saturday evening and during Sunday brunch. Ristorante Cavour is known for its unique Northern Italian cuisine. Upscale dining, closed on Saturday for lunch and Sunday open for breakfast and brunch only.